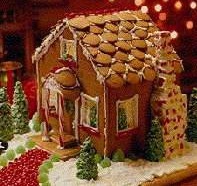 Decorating your Gingerbread House is fun and there are a lot of ways to creative with simple things and ingredients around your house. Have you ever used popcorn for making trees and bushes for your Gingerbread House? How about taking some red and green food coloring and tossing the popped corn into it for a red and yellow colored effect? Or, good old fashioned salt dough that can be colored, painted and glued. After mixing the dough, you can roll or cut it into different shapes which, after baking, can be painted with acrylic or poster paints, and further decorated with glitter, glued-on rhinestones or other whatever suits you. Visit here to get the recipe and more ideas.